ive rooms of the Wyoming Geological Survey building still hold field notes, rocks and memorabilia from David Love's life. "It's a monument to chaos," he says. "I call it the stratified wilderness." It makes sense that Love — along with his son, geologist Charles Love — is rallying his fellow geologists to start preserving their personal libraries, field notes and various collections. It makes sense because David Love has a history of enthusiastically embracing a cause and taking charge of a project, and because he himself has acquired more than 55 years of field notes and photos of his own adventures and the details of Wyoming’s geology and landscape. Retired in name only, Love is 86 years old, a father of four, scientist emeritus with the U.S. Geological Survey (USGS) and regarded by his colleagues as one of Wyoming’s most important geologists. His worn, brown boots and bolo tie confirm his life-long love for his native state and its geology — most of which he’s mapped or made sure was mapped. He spent his childhood in Wyoming’s vast spaces and most of his adult life in the field. He is one of the great Rocky Mountain field geologists and has been studying Wyoming’s geology since at least 1942, when he started working with the USGS. Even though he “retired” in 1987, he is still working, advocating one cause or another, occupying an office in the Wyoming Geological Survey building and teaching at the University of Wyoming and other universities. The university appointed him an adjunct professor without salary. He estimates he’s trained 25 geologists. The American Geological Institute last year awarded Love its first Legendary Geoscientist Award, which recognizes a geoscientist who has produced scientific achievements and service to the earth sciences that have lasting, historic value. Accepting the award in October during the annual meeting of the Geological Society of America, Love gave an audience of geoscientists two charges: first, to archive their own collections of field notes and photos; and second, to think beyond their disciplines and consider the relationship between geology and human health. “I don’t think we could make a better contribution to geology and human health than to tie them together,” he said. Love has been advocating the application of geology to human health since at least 1949, when he and other geologists were snowed in for nine days during a meeting in Salt Lake City. It was an international conference meant to address the effect of poisonous trace elements — selenium, molybdenum and tellurium, for example — on people and animals, and what geology could contribute to understanding it. Love has pursued this mission during his entire career. He gave many talks on the subject, the first one in 1978 at the University of Washington. “Human environment, good and bad, starts with the rock, coupled with the other two major necessities, water and air,” Love said in a 1984 Edison Foundation Distinguished Lecture, a talk he gave again several times at many universities. “Ruin one of these three basic essentials and humanity is in deep trouble.” He’s been known to get particularly upset about how selenium, which woody asters and other vegetation not native to Wyoming absorb from underlying soils, can make its way from plants to animals to humans. Selenium is toxic in large amounts, causing health problems similar to those caused by arsenic, such as lung and liver damage. Love’s sense of the relationship among these four elements — water, air, rocks and the human environment — began long before 1949. He says he first saw it when he was growing up on the Love Ranch in Wyoming. “You could see the intertwining of all the facets of nature there,” he says. He was born on April 17, 1913, as John David Love to ranch owners John G. and Ethel P. Love. He was raised in a log cabin 12 miles from Wyoming’s geographic center and 5,670 feet above sea level. He spent his childhood on the Wind River Basin south of Riverton, Wyo. “As a small boy with no playmates except my brother, 18 months older, my world revolved around my parents, wild range cattle, bronky horses and hard-bitten cowboys,” Love recounted when he accepted honorary membership from the American Association of Petroleum Geologists in 1995. 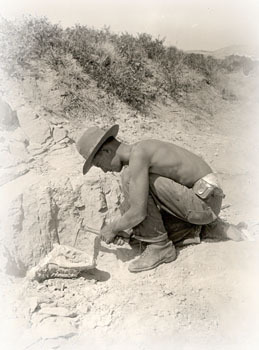 He grew up seeing the results of geologic processes, but began officially studying it when he started taking geology classes in 1929 at the University of Wyoming. He studied with geology professor Samuel Knight, whom Love still cites as a strong influence. He earned his bachelor’s degree (1933) and master’s degree (1934) at the University of Wyoming and then went to Yale University to earn his doctorate. Before he left Wyoming, though, he met fellow geology student Jane S. Matteson, whom he married in 1940. They celebrate their 60th wedding anniversary June 1. “We decided way back that this was going to be permanent,” he said in a recent phone interview. After he earned his doctorate in 1938, Love spent a summer working with Arthur Baker, another geologist he cites as a strong influence, for the USGS in the Wasatch Mountains. From there he spent four years in the mid-continent and southeastern United States doing subsurface and geologic mapping for Shell Oil Co. In 1942, he found himself back in Wyoming as party chief of the Mineral Deposits Branch of the USGS. Part of what brought Love back to Wyoming was his knowledge of the stratigraphic occurrence of vanadium ore in the state. Vanadium was needed for the armor plates protecting U.S. planes, tanks and battleships used for World War II fighting. In 1943 Love opened the USGS Laramie field office to run the survey’s Fuel Branch as supervisor of geological investigations aimed at enhancing domestic petroleum exploration during and after the War. He would spend 45 years with the survey, most of that time mapping Wyoming geology and finding its resources. Even when the USGS closed the Laramie office in 1987, Love refused to leave Wyoming for a different survey office. Gary Glass, then the state geologist, let Love hole up in the Wyoming Geologic Survey building. It wasn't the first time he had made a choice to keep his freedom to explore Wyoming’s geology. Word has it that after Love discovered the Pumpkin Buttes uranium district in 1951, one company offered him $1 million to leave the USGS and stake out a claim for it at Pumpkin Buttes. But he turned the offer down. “It was tempting,” he remembers. “But it would have been totally unethical. And it was exciting to have a relatively free hand.” He and other geologists were explorers and continued searching for other uranium deposits. Eventually, Love remembers, some 20 companies began mining Pumpkin Buttes. It was a gold rush uranium style. “It was a wild time. Love spent most of his career working in the field, and directed the compilation of the 1955 and 1987 Wyoming state geological maps, still the only complete maps of the state’s geology today. His later years with the survey he spent traveling the world looking for gold deposits. In author John McPhee’s Rising From the Plains, an account of Wyoming geology and David Love’s life, Love estimates he spent one-quarter of his nights sleeping under the stars — a conservative estimate. Congratulations on receiving the American Geological Institute’s Legendary Geoscientist Award! Your important contributions in the field of geology have done much to benefit not only the Sate of Wyoming, but the nation. This award is indicative of the recognition you so richly merit. Dave, you are the epitome of what we hope for in each of our teachers. You have never hesitated to share your knowledge, and you have been an inspiration for hundreds of young, aspiring geologists. Your legacy as a scholar, mentor, writer and storyteller is extraordinary, and confirms the fact that we hold you in high esteem. Your many published works on the geology of Wyoming and elsewhere will forever be recognized by your peers and the public as primary resources. I take great personal pleasure in sending congratulations to you on behalf of the citizens of Wyoming. You truly deserve the designation of Legendary! Love in Wheatland, Wyo., in 1933. Bartlett is the managing editor of Geotimes.